SUSAN R KNOX / PATENTED / NOV. 20, 1866 CAST IRON AND BRASS FLUTING IRON. I BELIEVE IT TO BE COMPLETE, BUT AM NO EXPERT ON FLUTING IRONS. THE EMBOSSED ADVERTISING CAN BE HARD TO READ IN AREAS, BUT CAN BE MADE OUT WITH EFFORT. 2-3/4" WIDE. VERY GOOD COND. A Beautiful and Early 1860's Scottish Sad Iron in excellent condition with only minor wear from use. A nice example. On the iron it states " PAT AP FOR" and the number " 3 ". Clean and Rust Totally Removed But Beautiful Looking Rustic. RARE, antique 19th century, Miniature Bronze LION SAD IRON with original TRIVET. Trivet = 5-5/8" x 2-3/8" x 5/8" high. Iron = 3-1/4" long x 2-1/8" wide x 2-5/8" high (top of lion's head). The center of trivet has a circles & spokes design. Very good condition. Here is a recent estate find. 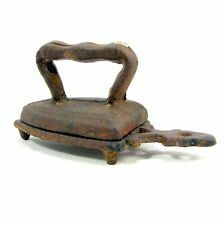 This is a Rare Antique 19th C. Cast Iron Victorian Sad Iron Clothing Iron, made in the USA. 6 1/2" x 4 1/4" x 5 1/2". Don't Pass This One Up, You Won't Find One Like This Again! Antique 19th Ct Solid Brass Sad Iron. Weight : 923 Grams. that both of us will be happy with. Inventory Number 6465. Dover Sad Iron. The iron is 4" x 2" x 1" wide. Good to fair condition for its age with no cracks, breaks or repairs. It does have severe surface rust and pitting. I will declare all major casting flaws that I find. 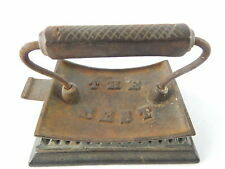 One original antique from circa early 20th century German clothes small sad iron. Alcohol burner heated with tank container at the back. The iron in excellent condition and fully functional. Marked on the tank lid. Marked "Haven & Co. 6 Pat Sep. 9. 73" on top. A solid old iron that is unique in design. Haven & Co was based in Cin. 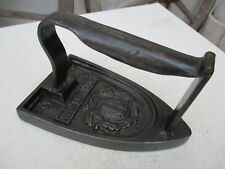 Would make a nice addition to any early sad iron, pressing iron, polishing iron, slug iron, old box iron, tolliker hat iron or antique iron collection. Inventory Number 8687. Asbestos Sad Iron. Good to fair condition for its age with no cracks, breaks or repairs. It does have severe surface rust and pitting. I will declare all major casting flaws that I find. Hello, you are viewing my sale for an Antique Sad Iron. This is a Country Decor Iron Doorstop Paperweight Bookend. There is a Spiral Handle on the top. Wait for final invoice after you have completed your selections. Worn Wooden handle. Bottom of inside tank is marked with a C ?. on one side and a 3 on the other. Top lock and Rear lock seam to work well. Vintage GE Universal Travel Iron Plus Accessories~VGC~Fast Shipping! Also included is a spray bottle and spray pump which can be used alone, or the bottle can be attached to the iron for steam ironing. Images #2 and #3 show the cotton travel bag before and after being ironed with the Travel Iron. Iron is marked Patented Dec 12. 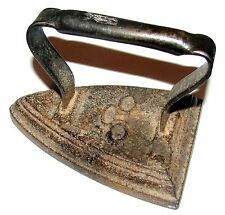 Iron is in good used condition, has surface rust easy to clean. Weighs 5 lbs. This rare pressing iron, with a back tank, was heated by alcohol. Between the body of the iron (an ox tongue type) and the handle, fixed with two screws, is a plate which doesn’t allow the heat to burn the person using the iron. Here is a recent estate find. 4 3/4" x 5 1/4" x 2 1/8". Don't Pass This One Up, You Won't Find One Like This Again! This Will Make a Stunning Addition to Any Collection. Estate Fresh, Sold As Found! Late 1800's Ober antique cast iron tailor sad iron marked "The Ober Mfg. Co. 16 Chagrin Falls, O." on top. Good condition, no breaks or repairs, bottom is smooth with normal usage wear. Photos show the condition and markings fairly well. Vintage Cast Iron Flat Clothes Iron, #6, Door Stop, Bookend. Condition is Used. Shipped with USPS Parcel Select Ground. 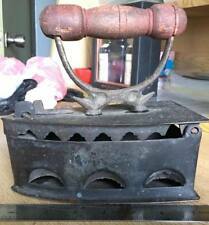 Early antique cast iron natural gas iron Marked "Wright Pat. For" on top. Appears to have never been cleaner. Other than the plating it is in good condition, bottom is smooth, no breaks or repairs. Antique gas iron length 16.5 cm. &quot;FLETCHER LAUREL&quot; Iron rarely !!!!! Antique gas iron length 16.5 cm. "FLETCHER LAUREL" iron rare !! Late 1800's, about 1875 antique cast iron fluter crimping iron marked "The Climax" on top and was patented by H.B. Adams. Also used for crimping and pleating fabrics. 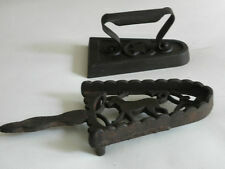 Would make a nice addition to any old antique cast iron fluter, crimper or unusual sad iron collection. The sprinkler is yellow and white but alot of the cork is missing. Early old antique cast iron sad iron, special purpose iron. Has an unusual design that possibly may have been for tolliker or hat irons?. or could be considered a polishing iron. I could not find anything in my reference books with this unique design (see photos). Bottom surface is smooth. Cord is intact, but does feel a bit dry inside. Vintage Small Red Cast Iron Flat Clothing Iron with Black Handle 5.5x4.5x3.25"
Works well and shows little use. Very usable. Cloth cord like new. See pics, rusty, wooden has burn mark, wire holds knob on handle, handle works on all 3, top plate on one has a chip. GE Power Spray Steam & Dry Iron H11F92 | Fast Free Shipping !! GE Power Spray Steam & Dry Iron H11F92. Check out all photos above for complete physical details. Great Condition. ANTIQUE SAD IRON MARKED "BROOKDALE" "4".